Yoga is spreading more and more among adults, but still few people know that that it is also suitable for children. YIS together with the great teacher Petri Raisesen and the Gioca Yoga Salento team offers two weeks totally family friendly, designed specifically to allow both adults and children to make the holiday a unique and transformative experience. Yoga is among the most complete and healthy disciplines for body, mind and spirit; practiced by children allows to prevent various physical and psychological disorders and discomforts. During a yoga family retreat the sharing of the practice also becomes a nice social moment to be shared with mum, dad, brothers and sisters. In this way you can spend time together, having the opportunity to strengthen relationships with your children. The organizers and teachers of the yoga family retreat are themselves parents and know the advantages and benefits of integrating yoga in the family environment, to share the yoga holiday in an empathic way. In these two weeks everything has been thought of: the yogi parents will practice yoga in a room and at the same time the children will participate in the other room at a yoga retreat completely dedicated to them. In the first 10 years of life, movement is very important, because through it the child grows healthy and balanced. Today more than ever, the movement is prevented and the children stand still for many hours sitting on the school desks, then at home to do their homework and finally in front of the PC, TV, video games. The immobility to which the body undergoes accumulates the stress, the agitation and the nervousness that they can not discharge. Yoga is precious: unlike many sports activities, it is a non-competitive activity that frees you from stress and anxiety with the advantage of promoting relaxation, self-discovery and your own faculties. Yoga leaves the child free to practice an activity as if it were a game to discover their physicality and their inner self. On a physical level, yoga is useful in children who have problems related to posture: it helps to keep the spine upright and aligned and to maintain a correct posture. The movements become more coordinated, the body more agile, flexible and resistant. It also helps to develop a correct way of breathing, which is essential for the proper functioning of the metabolism and to maintain our vitality. On the mental level, however, it will become more careful, calm and centered. And he will learn about emotions and thoughts, establishing more peaceful interpersonal relationships. The relaxation exercises included in yoga allow you to have more relaxation and drive away negative feelings such as fear, anxiety and worry. Even at the psychic level, yoga has many benefits: it is able to strengthen the individual identity of the child, strengthening his character and teaching him to manage internal conflicts through willpower. And we must not forget the playful aspect: a yoga session is in fact different from that for adults, and is created in such a way that imagination and creativity open the way to fun and play, while keeping intact the spiritual aspect of the discipline . The various positions, which already have in themselves fanciful names (among which stand out tree, flamingo, dolce far niente, cow, boat …) are usually presented in the form of a fairy tale, story or poem: another device that helps to develop the cognitive and social skills in the child. WE PLAY WITH YOGA, two weeks with yoga for children aged 4 to 12 (possibility for adults and parents to practice yoga at the same time as children). Each child will learn to know the conscious breath, the positive image of himself and the techniques to connect with his emotions. 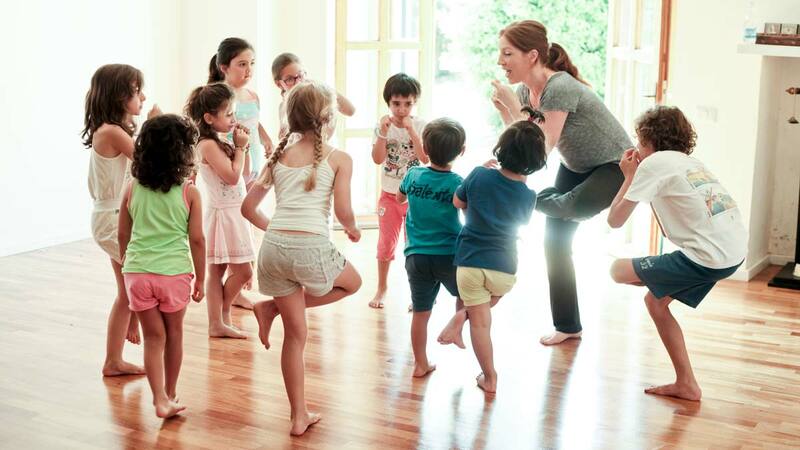 With children, yoga becomes a game and a wonderful tool of self-education, to move together in harmony and joy. Thanks to the use of fairy tales and legends, through which the positions (asanas) are built to the rhythm of breathing, children learn to know their body and relax, improve their coordination skills and posture, unload the tensions, discover the its uniqueness (ability to rely on one’s own feelings) and the pleasure of sharing, with mutual support (asana in pairs) without competitiveness. THE ENTRY RITE: to enter the space of yoga. THE CIRCLE OF FRIENDSHIP: a moment of sharing and knowledge. HEATING: with games that stimulate awareness and strengthen self-esteem. PRACTICE: a narration of history through the positions of yoga, to the rhythm of breathing. RELAXATION: with short visualizations guided by the teacher’s words or by creating and coloring mandalas. In your free time you can immerse yourself in the beauty and silence of nature, relax in the spa or with a massage or take trips to the nearby beaches of Salento.